In this example we are going to go over how to use the built in RPC methods inside of Forge Networking Remastered. In this example we are going to make a scene that already has a cube in it, then if anyone presses the up arrow key it will move the cube up, if anyone presses the down arrow key, it will move the cube down. 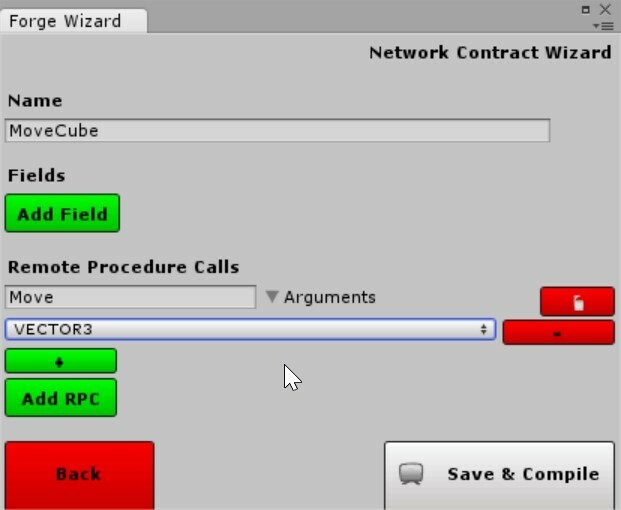 Once you have opened this editor you will be presented with a list of all the Network Objects currently available, to learn more about this please see the document on the Network Contract Wizard (NCW) as we will just be going over how to create a network object through the contract wizard. To start, click on the "Create" button near the top and you will be presented with the create UI. In here, we have 3 major fields of interest, the Name fields, the Fields field, and the Remote Procedure Calls field. The Fields section shows all of the various fields that our network should be aware of. The Remote Procedure Calls field is where you will design any Remote Procedure Call (RPC) function signatures. This is going to be our main area of focus for this example. In this option, we will create 2 RPC methods with no arguments. One RPC is to move the cube up and the other is to move the cube down. In this example, you may be curious what the Vector3 selection was for. This particular selection was to set the data types that will be sent as arguments to this method. Since we will be sending a direction to move in, this is a Vector3 , that means that we would need to pick it. The order of these type selections (if we had more than one) are explicit. That is to say that the order you select them in, is the order that you would pass argument types in, just as if you were writing a method in C#. 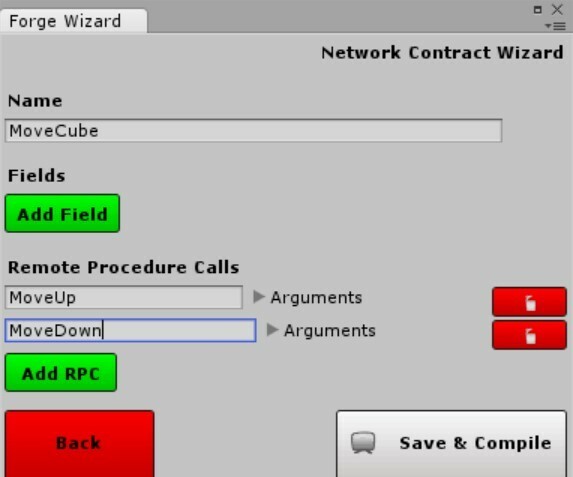 When we use the Network Contract Wizard (NCW) we are actually generating a lot of network code based on what has been input into the editor fields, this actually cuts out a lot of work that you would have to do by hand. There is one class that we want to extend from, this class name will be " MoveCubeBehavior". The naming convention for this generated class is _____Behavior where "_____" is the name we typed into the NCW. Let's now create a C# file in Unity and write our basic game logic, we will name this file " MoveCube". As you can see from the code snippet above an RPC is called using the networkObject.SendRPC method. The first argument is the name of the method and the second argument is the receivers of the object which could be set to things like AllBuffered, Others, etc. The moment the RPC method is called it is sent on the network to be replicated to the other clients (including server if called from a client). Note: _In this example, it doesn't use a buffered call and it does not actually synchronize the position, so the client should be connected before the cube is moved. Note 2: Notice that we use MainThreadManager to run the move logic in this example, if you have not used the MainThreadManager before or would like more information about threading in Unity, please view this page. As you can see from the code snippet above an RPC is called using the networkObject.SendRPC method. The first argument is the name of the method, the second argument is the receivers of the object which could be set to things like AllBuffered, Others, etc, and the last argument(s) are the arguments for the method. The arguments are mapped to the object args of the method in the order that they were sent in. The moment the RPC method is called it is sent on the network to be replicated to the other clients (including server if called from a client). Note: In this example, it doesn't use a buffered call and it does not actually synchronize the position, so the client should be connected before the cube is moved. Now that we have done all of the network programming required for our end goal, it is time to setup our scene.